Christmas is fast approaching and there is no better way to get yourself geared up for the festive season than with a cosy winter jumper that just screams “I love Christmas”… or perhaps not. Whether you’re Christmas crazy or a total humbug, there will always be an occasion where it is totally acceptable to wear a ridiculously ugly jumper all in the name of St Nick. And yes, we’ve found our fair share of funny and outlandish jumpers that will go down a treat at your office party – think bright colours and novelty character jumpers. But not all festive jumpers have to be so OTT. If you’re looking to keep it casual this winter, then we’ve also found a range of subtle and stylish jumpers that won’t get heads turning quite as much as some of the others. From jumpers that will provide comedy value amongst friends to something that will keep you warm all throughout the winter, we’ve found a whole host of designs to suit all styles and budgets. If you know a Star Wars fan who is struggling to get in the Christmas spirit, then this jumper is sure to bring some festive cheer into their wardrobe. Yoda takes the role of the Grinch in this design and makes for a cool alternative to the traditional Christmas jumper by combining classic Fair Isle patterns and pop culture; a great combination that wins our top spot! You can also get a range of other Star Wars characters such as BB-8 and they are official Star Wars Products that collectors of merchandise will love. For something a little more subtle, this John Lewis number wouldn’t look out of place in any winter wardrobe. It features a classic Fair Isle design in complementary neutral colours of navy, cream and red. For those who want to give back this Christmas, you’ll be pleased to hear that £10 is donated to charity for every one of these jumpers sold, making it a winner all round. You can wear this jumper to dinner with the in laws, to the office or even down the pub, and it won’t look out of place in January either! Overall it is a high-quality jumper that will do more than just keep you warm this Christmas. If you really love Christmas, then here’s how to make a statement. This bright and colourful 3D jumper literally jumps out at you, and will not fail to put even the Grinchiest of Grinches into the Christmas spirit. It’s the perfect novelty for those awkward Christmas parties, and is sure to turn heads this winter (we can’t guarantee this is a good thing). On a serious note, this jumper is extremely soft and warm, making it a great all-rounder for all your festive fun. For an alternative to a jumper, this sweatshirt is loved for its comedy value more than anything else. Dabbin through the Snow might not mean anything to many of us, but to the younger generation this sweatshirt is bang on trend. Users say this sweater is of surprising quality considering the low price, but they do come up small so make sure you opt for a size or two up. This would make for a great item to lounge around in on Christmas day or as a solid contender in an ugly Christmas jumper competition. This Coca-Cola Christmas advert is one of the first things that signify the festive season is well and truly on its way. 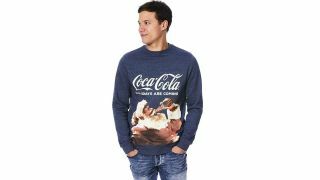 This “Holidays Are Coming” sweatshirt is another casual alternative to the traditional Christmas Jumper. Its denim-effect means it can be easily paired with all outfits and worn either out and about or to lounge around in at home. It may not be as thick and cosy as some jumpers, but the cotton makes it super soft to touch. This Elf Christmas jumper is certainly one for those who love the novelty of Christmas. It is very bright and would be ideal for themed parties, but wearing it all month could be overkill. If you want to get a silly secret Santa present for a family member, friend or colleague, this is a great quality buy that will keep them warm this winter. If Christmas jumpers really aren’t your thing but you don’t want to seem like a total humbug, then this minimalist jumper will save you from being labelled the office scrooge on Christmas Jumper Day. It is a little pricey considering how minimal it is, but it is made from cotton which means its super soft and the navy will go nicely with almost any outfit. Once you've got your festive fashion sorted, make sure your DIY skills are up to date and get decorating with our pick of the best Christmas lights for indoor and outdoor use this festive season.